1. Follow package directions to cook the pasta. When you drain the pasta, reserve 1/4 of the cooking water for later use. Once drained, return the pasta to the pot. 2. Heat the olive oil in a large skillet over medium-high heat. Toss in the garlic, onion, 1/4 teaspoon salt, and 1/8 teaspoon black pepper. Stir your ingredients for about 4 to 5 minutes or until they begin to brown. 3. Add the kale to the large skillet and toss for 2 to 3 minutes or until tender. Mix in the tomatoes and cook for 1 to 2 minutes or until soft. 4. 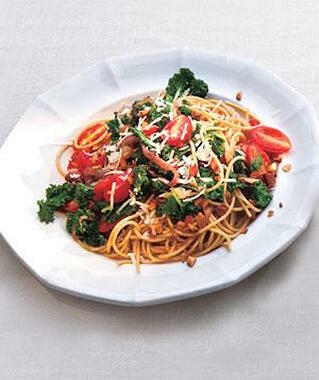 Combine the almonds, pecorino, reserved cooking water, and the kale mixture with the pasta. When serving, add your desired amount of the additional pecorino and enjoy. If you find that de-stemming your large leaf kale is too much for you, use baby kale next time to avoid the thick stems. Some people even argue that baby kale is tastier and more tender. Regardless, feel free to make adjustments to the recipe. Need some heat? Add red pepper flakes. Now get to cooking!